Our engineers offer a wide range of consulting services to support the planning, analysis, and design of water management modeling. Conversion and consolidation of existing water management models or transfer of model parameters into SWMM5 and PCSWMM, including legacy SWMM4 models, spreadsheets, asset management databases, GIS shapefiles, CAD drawing files, etc. Take a look at some of the projects we've recently consulted on. These highlight how our consulting engineers work in tandem with clients to achieve their project objectives. Originally designed to convey a 5-year storm event, a recent analysis estimated the capacity of the Don Mills Channel to be less than a 2-year storm. This insight led the City of Markham to retain The Municipal Infrastructure Group (TMIG) and Computational Hydraulics Int. (CHI) to build an integrated PCSWMM 1D-2D dual drainage model of the approximate 7.3 km² channel study area. Discharging into the German Mills Creek, the Don Mills Channel is 3 km long and the study area is comprised mostly of commercial and light industrial development, with some residential areas. The completed model consists of approximately 120 subcatchments and 500 conduits representing almost 38 km of drainage network – including storm sewer pipes, major system flow paths, culverts, ditches and the channel itself. Calibration of the model was based on observed high water marks from two historical flooding events: August 18th, 2005 and July 27th, 2014. An integrated 2D model component was added to better represent floodplain storage and conveyance throughout the study area. Moving forward, the objectives remain to: estimate existing capacities of minor and major drainage system infrastructure under different design storms and recent major storm events; evaluate overland flow paths; estimate hydraulic grade lines in storm sewers; identify problematic areas due to capacity of the current drainage systems; and evaluate new developments and intensification on the capacity of major and minor drainage systems. Agricultural production continues to expand and intensify around the world. In rural watersheds with complex stormwater conveyance systems, models designed to predict the downstream impact on water quality and quality due to changes in on-farm management practices tend to inadequately represent the spatial and temporal resolution required in the simulation of hydraulic systems. In search of an innovative and cost-effective solution for increasing water quality, conserving water and lowering energy use, Ausable Bayfield Conservation Authority (ABCA) retained Emmons and Olivier Resources Inc. to assist in launching a new Rural Stormwater Management Model (RSWMM) as part of the Healthy Lake Huron project. PCSWMM and SWMM were chosen to help simulate the downstream impacts of a suite of Best Management Practices (BMPs) in order to improve water quality and quantity in the Bayfield North watershed. PCSWMM was used to manually verify subcatchment delineation, perform calibrations through its Sensitivity-based Radio Tuning Calibration (SRTC) tool and simulate sand, silt and clay using its Modified Universal Soil Loss Equation (MUSLE) routine. Additionally, four pollutants were calculated using PCSWMM’s Derive Functions tool: Total Nitrogen (TN), Total Suspended Solids (TSS), Particulate Phosphorus (PP) and Total Phosphorus (TP). Setting up BMPs using a field shapefile was facilitated by the software’s ability to (a) define enforced value lists for attributes; (b) group attributes into customizable categories; and (c) auto-express attributes. 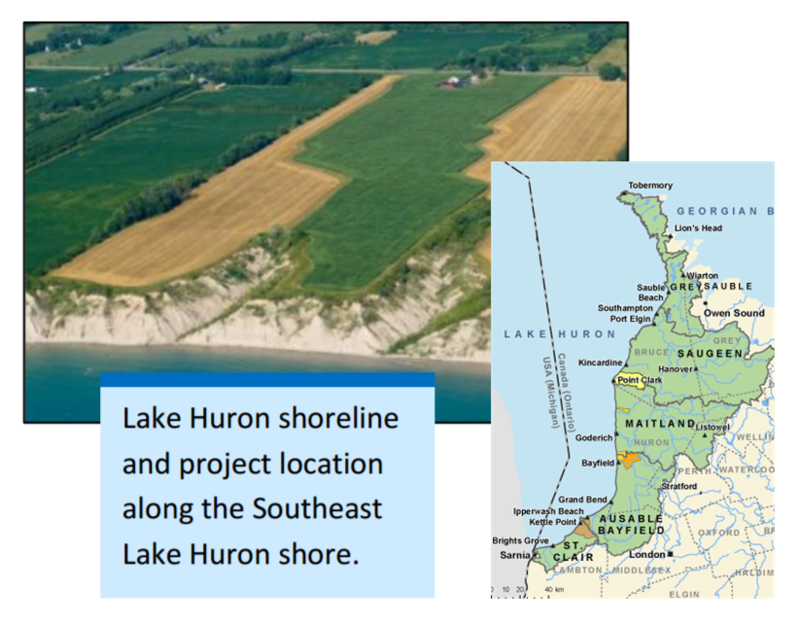 This exciting new resource is enabling landowners to make increasingly informative decisions about erosion and runoff control projects; and rural extension staff are now better equipped to design soil and water conservation projects which protect and improve water quality in Lake Huron. Downtown Fort McMurray is highly susceptible to flooding – especially under extreme ice jam conditions. To avoid riverbank erosion, washed out roads and threats to private property and public infrastructure, the Regional Municipality of Wood Buffalo utilized PCSWMM’s integrated 1D-2D modeling tools to simulate urban and riverine flooding compounded by ice jams in the Athabasca River. A combination of ice-related and open water flood conditions were represented in the 2D hydraulic model. One extreme condition was an approximate 100-year ice-jam stage event concurrently with 100-year return period streamflow in the upstream rivers and watercourses. In addition to the 2D model, PCSWMM’s Watershed Delineation and Transect Creator tools were used to set up a 1D model of an upstream watershed. Training on the development and application of integrated 1D-2D modeling was also delivered to help staff better visualize and depict flood inundation results that would be suitable for presentation to senior staff and elected officials. 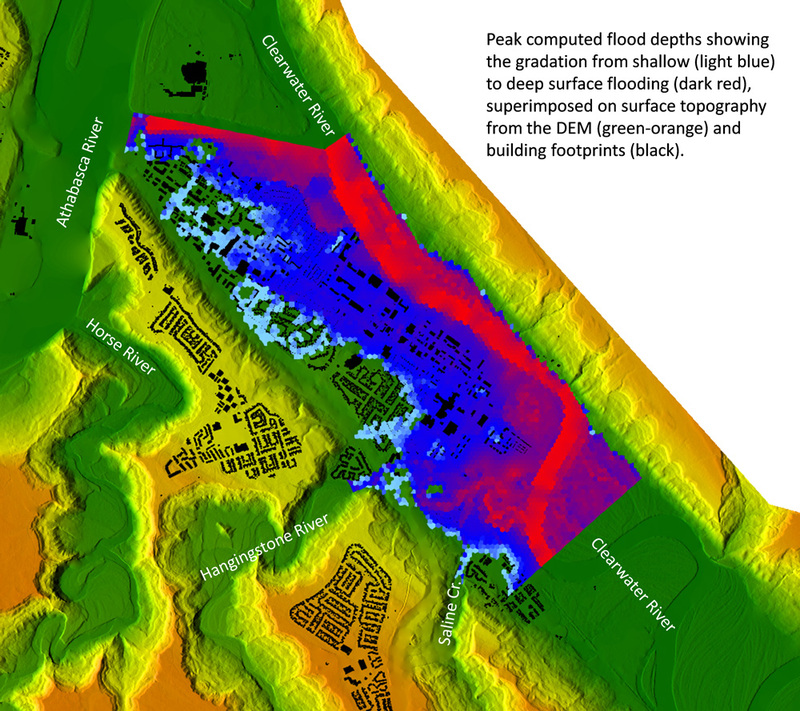 As a result of this project, recommended enhancements to the model were identified and a series of videos were prepared to highlight flood inundation extents and velocity vectors throughout the 26.4 km² (10.2 mi²) study area. 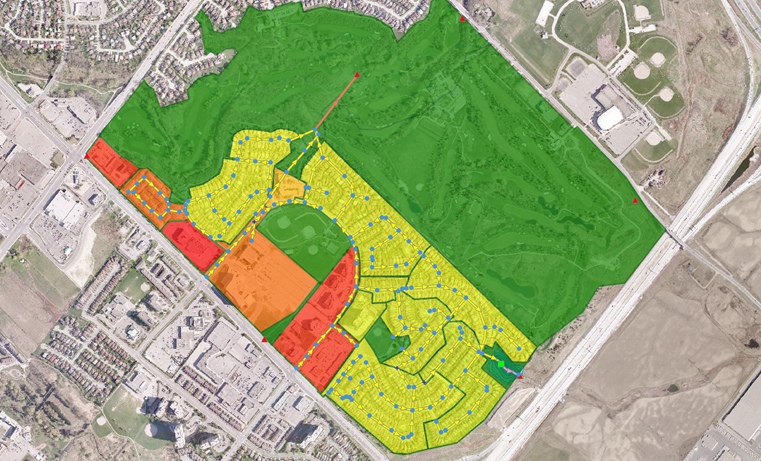 Located entirely within the City of Mississauga, the Cooksville Creek watershed has been under increasing urban development pressure since the 1940’s and has experienced flooding during recent large storms. In response, working closely with the Credit Valley Conservation Authority and the City of Mississauga, CHI developed a detailed hydrologic/hydraulic dual drainage (i.e. minor/major system) model for the watershed using PCSWMM. The objective was to determine overland flow routes (major system), hydraulic grade lines and the capacity of existing storm sewers (minor system), as well as to assist with master planning and historical event analysis. PCSWMM was utilized because of its ability to efficiently process and calibrate the highly detailed 33 km² dual-drainage watershed model, which included more than 4,000 subcatchments, 8,000 conduits and 500 km of drainage network. Model calibration success was measured using Nash–Sutcliffe efficiency coefficient for maximum and total event flows, indicating a very good calibration at the flow gauge location. The model continues to be instrumental in helping the City of Mississauga understand the effect of drainage infrastructure improvements on reducing the extent and frequency of flooding. Flooding in urban areas can cause significant property damage and human injury. Historical extreme precipitation events in the Toronto area have highlighted the need for enhanced warning systems to inform decision making prior to a storm’s arrival. In response, Computational Hydraulics International (CHI) and the Toronto and Region Conservation Authority developed a high resolution, deterministic, physically-based, remote-sensing, real-time flood forecasting and web-based decision support system. This system has since been applied to the Don River watershed, which is home to 1.2 million people and covers 360 km² of drainage area – 80% of which is highly urbanized. The project goal was to enable flood duty officers to make more informed decisions by providing them with predicted peak flows of a storm event at least two hours, and as much as 24 hours in advance. Integrating PCSWMM Real-Time, NEXRAD radar data, US EPA SWMM5, HTML5 and Google Maps, the system forecasts near-future water surface elevations and relays the information to a web-based platform for analysis and decision making. Key features of the flood forecasting system include: real-time radar-rainfall acquisition, processing and forecasting, real-time flow and rain gauging, continuous hydrologic modelling, flood vulnerable asset analysis and predictive weather modelling. 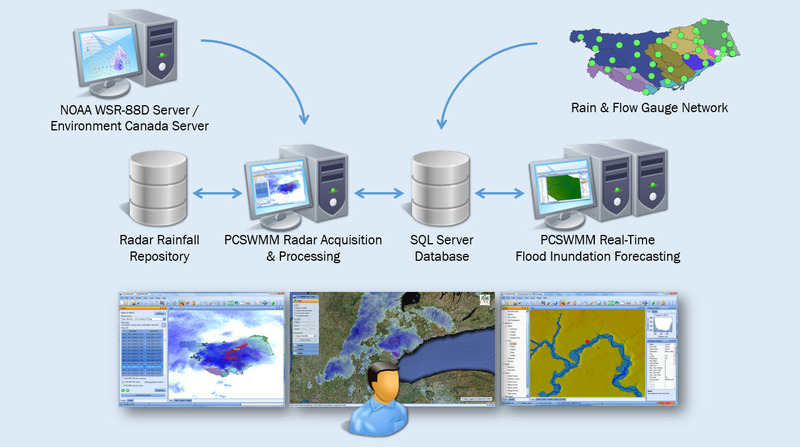 RADAR acquisition and processing capabilities in PCSWMM allowed use of high spatial and temporal resolution rainfall and the ability to track storm speed and direction, as well as the ability to “ground-truth” or calibrate rainfall estimates using a network of ground-based rain gages in the watershed. CHI used the HEC-RAS model import tools of PCSWMM to generate the hydraulic components for the model. The Don Valley flood forecasting model computed eight of the ten highest peak flows within a 10% margin of error and the remaining two within 20%. 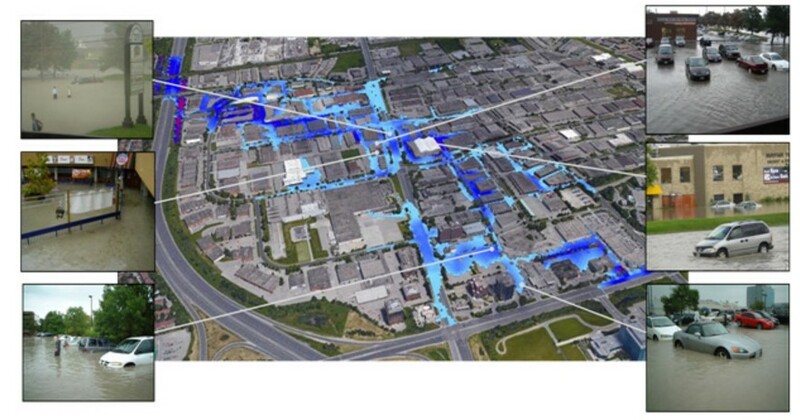 Performance of the PCSWMM model for historical events provided sufficient confidence to Toronto and Region Conservation Authority officials to use the methodology in real-time flood forecasting and warning. As part of an effort to prepare Brampton, Ontario's County Court neighborhood of 5,800 people for climate change and help the community become more environmentally friendly, greener streetscapes were sought. 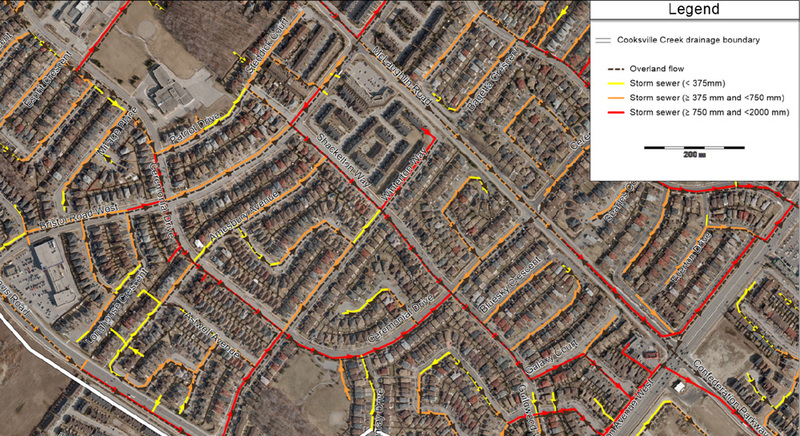 Referred to as the Sustainable Neighbourhood Retrofit Action Plan (SNAP), this project involved using PCSWMM to evaluate a variety of Low Impact Development (LID) scenarios to determine which ones lead to the greatest improvement in stormwater quality and quantity. Flow monitoring data collected from two storm sewer locations was used for model calibration, and water quantity was continuously tracked. PCSWMM was utilized to create the SWMM5 model as it has a number of built-in tools that assisted in project management, assembly, calibration and inference; including its physically-based LID/GI modeling approach, topological tools for fast parameterization, and the Sensitivity-based Radio Tuning Calibration (SRTC) tool that reduced the time required for calibration. Since the completion of this project, the City of Brampton has since successfully installed its first bio-filter swale and identified a multi-objective solution, addressing irrigation and untreated stormwater. McNamee, Porter & Seeley, Inc.
One of our friendly staff will be soon in touch with you.